This lightweight electric folding bike from Viking’s Power-city range has a powerful battery with a 45 miles range on one charge. Charging time is 4 to 8 hours. The charger is provided 220V 50 HZ. The frame is 15.5 inch made from lightweight aluminium alloy and comes in silver and the wheel is 20 inch. It has 6 speed Shimano gears. The handlebars are quick release and the pedals fold. There are mudguards and a luggage rack. The total weight is 18 kg plus 3 kg battery. The maximum weight for the rider is 95 kg. You can cycle or turn on the pedal assistance or go full throttle! This electric folding bicycle is certainly one to be enjoyed. 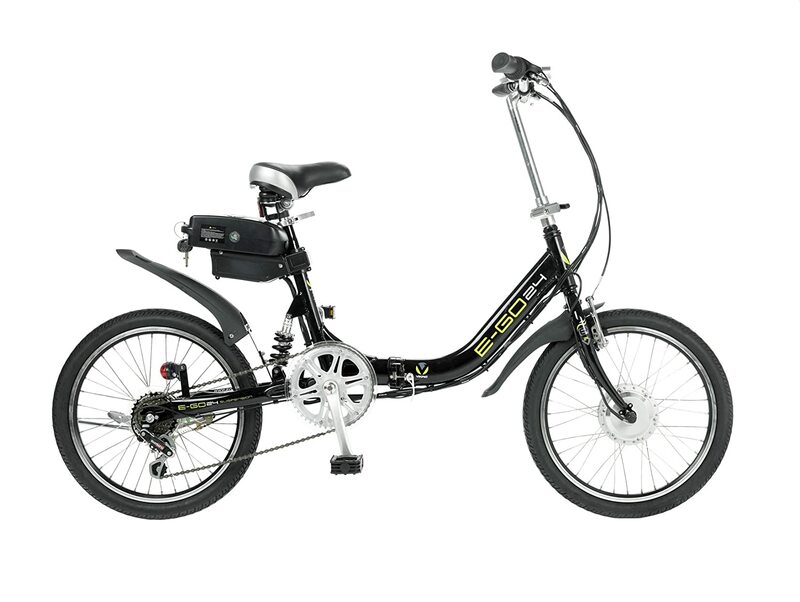 The Viking E-Go electric folding bike has an assisted range of up to 35 kilometres. It has a 250 watt brushless motor with a 24 volt – 9AH Lion battery. There is a controller with 3 levels of assistance mounted on the handlebar; the handlebar stem is adjustable. The folding alloy frame and stem make storage and transportation a little easier. The battery pack is easy to fit and remove for charging. There is an adjustable rear suspension unit so that the cyclist can dial in the preferred setting to deal with bumps. The Cyclamatic Foldaway Electric folding bike gives you the advantages of a folding bike with the bonus of a lithium ion battery to give power (with a range of 30km). The battery weighs much less than the traditional type of lead-acid batteries; has a low self discharge rate and is more environmentally friendly than standard type batteries; it is sealed to make it safe in rainy conditions and easily accessible for removal for charging. The wheels are 20 inch with stainless steel spokes for strength.This electric folding bike can also be used as a non electric bike using pedal pushing to get you along or there is a power assisted mode to get you going initially. There is a quick-release lever for ease of folding which the manufacturer say can be done in 5 mins. The motor is 250w and you can easily ride at the 15mph speed limit. It has 6 speed Shimano gears. Total weight including battery 23 kgs is and maximum weight for the cyclist is 110 kg. No road tax or licence required for folding electric bikes. The idea behind the Lynx LPX electric folding bicycle by PowaCycles is that the cyclist enjoys cycling and gets the physical fitness benefits from cycling with the backup of extra power as required. It has an adult sized frame made from lightweight aluminium. The height to handlebar is 107 cm and saddle height is 74-94 cm; the folded size is length 91 cm x height 74 cm x width 47 cm. The length of the cycle is 160 cm and weight is 20 kg. The wheels are 20 inch and it has v brakes front and rear.The lithium polymer battery is 24V 10Ah – 240 watt hours and range is 24-33 miles. Full battery recharge in 4-6 hours and weight of battery is 2.1 kg and a battery charge is included. The grip throttle has independent twist and there is a Shimano 6 speed mechanism. The gears make it easier to pedal – by pedalling less battery power is used and the distant that the folding electric bike is increased. With motor power only the maximum speed is 12.4 mph. The pedals fold and there is a kick stand.